Is it Safe to Place a Floor Jack at the Differential? Whether you're a home wrencher or an ASE Certified mechanic, safety is always the top concern when it comes to lifting vehicles. And, right or wrong, there are a lot of lifting methods out there. Some—many, in fact—will swear that it's safe to place a floor jack at the differential. This method is certainly faster, since it lets you place two stands after only jacking up one half of the vehicle. That's half the work and basically half the time to get a car in the air. Others will insist that the only safe locations for a jack are the OEM recommended jacking points, usually located toward the edges of the wheelbase on a pinch weld or vehicle frame. Basically, every owner's manual should tell you where it's safe to lift your car. But are there other safe options? 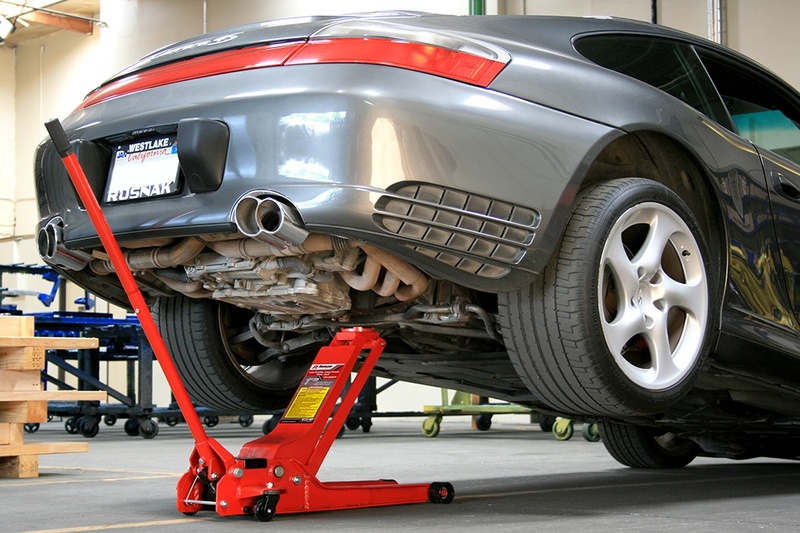 Professional mechanics with industrial-grade hydraulic jacks and years of experience under their belts are often seen lifting cars from their differentials, even if the differential isn't listed as a vehicle's OEM lift point. They can usually get away with it because of their training and equipment. Many homeowners are only equipped with little roadside jacks (sometimes referred to as "widow-makers" for a reason), and those jacks are not really safe for anything but quick, emergency roadside repairs. Over 2​32 words in and... we're not really giving you the answer you want, are we? Unfortunately, while this is one of the most-talked-about topics when it comes to jacking up cars, everyone seems to have a different answer for what you "should be doing." Ask your friendly neighborhood mechanic, and he'll probably tell you that he uses a floor jack against the differential all the time. He relies on experience to know which parts of a car or truck can support the force of the jack. Others will tell you to check your owner's manual or contact the vehicle manufacturer, and they'll leave it at that. And technically, that's a pretty good answer. Why? Just because something is probably safe, it doesn't mean you should interpret it as definitely safe. When the tire shop guys lift a car by the differential, they're probably being safe. Likewise, if you do the same thing from home with a good hydraulic jack, you're probably being safe. If your vehicle manufacturer says that the differential is a recommended lifting point, then you're definitely being safe. However, in all likelihood, your manual tells you to lift from the pinch weld or frame. When it doubt, follow the book! 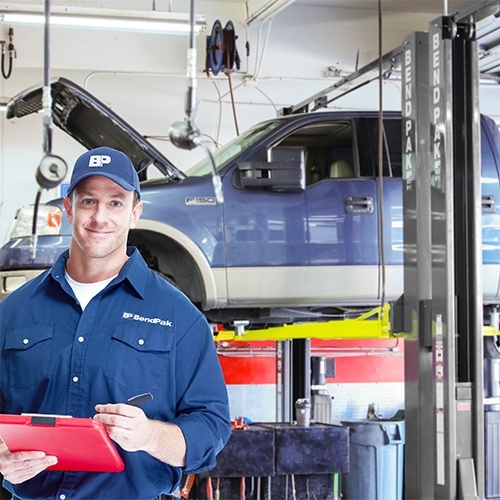 As a car lift and floor jack manufacturer that has seen just about everything there is to see go right and wrong in auto shops over the last 50 years, we know that the words "definitely" and "probably" are miles apart. Millions of people are going to jack up their vehicles by the differential this year, and only a small number will ever damage their vehicle due to negligence or a failed part. That might not mean much to some out there, but it means everything to us. So here's our stance on the debate: don't jack up your vehicle by the differential unless the manufacturer recommends it. It doesn't matter what your neighbor says, or what you saw the tire shop guys doing at breakneck speed without a hitch. At BendPak, we make all sorts of lifting equipment, and we've seen what happens when safety protocol isn't followed. All it takes is one instance of using the wrong lifting equipment, such as forgetting frame cradle pads when hoisting a truck on a two-post lift, and you're on a one-way trip to Lawsuit City, population you. Always use a floor jack to apply lifting force at the OEM recommended points, then place your jack stands appropriately—as close to the jacking point as possible. And always, always place jack stands before you work. Like everything in life, there are exceptions to the rules. As we said, if the manufacturer designates the differential as a lifting point, go ahead and lift. If you're doing work that requires compressed shocks, or other jobs for that matter, you may have to lift your vehicle by the differential. Since this will compress the suspension, it's never recommended to leave a vehicle up for long. Stick to the rules of safe lifting, use a high-quality, high-capacity floor jack , follow what your manufacturer recommends and don't be swayed by shortcuts. Do all that, and you'll have a long and healthy life working on cars.